Non-pensioners risk transfer: an attractive market? The size and success of the bulk annuity market is well understood, with close to £100bn of transactions completed in the last decade. What has received less recognition is the non-pensioner risk transfer market, which has the potential to offer an attractive opportunity for insurers and reinsurers. Is the non-pensioners risk transfer market attractive? There are many factors driving insurer interest in the non-pensioner market. Demand from pension schemes for insuring non-pensioners is currently high, and that’s expected to grow as many schemes look to complete the next step in their de-risking journey. We have already seen £20 billion of non-pensioner liabilities transacted, but this figure is just scratching the surface. Our analysis estimates that there are around £700 billion of liabilities in respect of non-pensioners aged between 50 and 65. There is also the potential to earn high margins, in return for the higher risk associated with the very long-term nature of these liabilities. Whilst the market looks attractive, non-pensioner business is not without its challenges. Not least of these challenges is the very long-term nature of the liabilities, meaning more uncertainty and therefore higher risk. Attractive pricing also depends on insurers’ ability to source higher yielding illiquid assets, which can be challenging at the durations required. The nature of the liabilities is also different. Unlike pensioner members, non-pensioner members have several options available to them which they may exercise before their benefits ever come in to payment. For example, they can choose to transfer out of the scheme, choose to commute some of their pension for cash at retirement, and, if they do draw their pension, they can also choose when they want to retire. This additional optionality adds uncertainty. Whilst pricing these various options can often be controlled for on a value basis, the timing of cashflows remains uncertain, which complicates the process of matching liabilities and adds to liquidity uncertainty. These challenges have been compounded by the lack of sufficient and relevant data to help price and manage these non-pensioner risks. We now turn our attention to one specific aspect of that optionality. Following a period of declining transfer rates, the number of people transferring out of their defined benefit pension increased dramatically since the introduction of pensions freedoms, with an estimated £50 billion being paid out in transfers between 2015 and 2018. This outflow was not steady over time, but instead was on an upward trajectory increasing from £7 billion in 2016 to over £20 billion in 2017. Latest data sources may indicate that this activity is slowing slightly, but that only adds further uncertainty to future transfer rates. As well as considering the transfer rates over time, it is important to consider how they vary by different types of member. 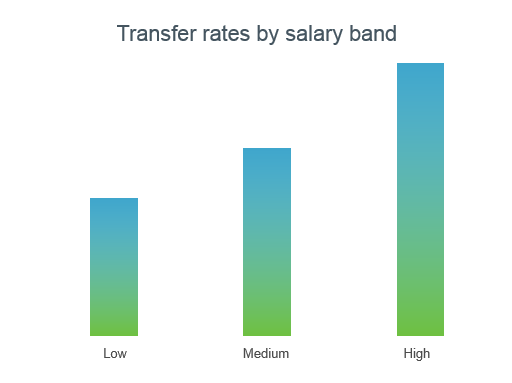 Our analysis of transfer rates based on the Club Vita data, which covers over 200 pension schemes, has shown that transfer rates are much higher amongst members who had higher salaries. The rate is roughly double for those in the highest group compared to the lowest group. There are a number of reasons why this may be the case. Those with higher salaries are more likely to be able to afford the necessary advice and are more likely to be financially sophisticated and confident about taking control of their own finances. Additionally, our analysis has shown that transfer behaviours vary greatly across industries and schemes. Understanding these dynamics will enable insurers to get a better handle on the underlying risks. This in turn enables greater confidence in pricing, a more evidence-based approach to dealing with members options, and a greater ability to justify assumptions to both internal and external stakeholders. Despite its challenges, the non-pensioner market remains an attractive proposition with huge growth prospects and the potential for higher margins. With the right expertise and data, many of the challenges identified can be overcome. For more information on our non-pensioner proposition, please contact Ailsa Dunn.